The New York State Canal Corporation's Hinckley Reservoir Water Levels Data page provides current information to the public and improves communication among the core agencies involved with the day to day operation of the Hinckley Reservoir and among responding agencies as reservoir conditions warrant. 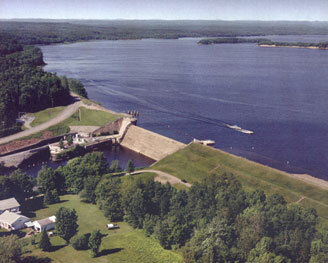 The Hinckley Reservoir is located in Herkimer and Oneida Counties approximately 14 miles north of Utica. The Hinckley Reservoir was constructed in the valley formed by West Canada Creek, which flows south out of the Adirondack Mountains and through the reservoir on its route to the Mohawk River at Herkimer. The surface area of Hinckley Reservoir is approximately 4.5 square miles when full and is fed by a drainage area of approximately 372 square miles. View the Hinckley Reservoir Watershed . Hinckley Reservoir has an average water depth of about 28 feet and a maximum depth of approximately 75 feet from the spillway crest. When full to the spillway crest, the reservoir has a usable capacity of approximately 25.8 billion gallons. Hinckley Reservoir was constructed by the State of New York and completed in 1915 for the purpose of supplying water to the Erie Canal. Hinckley Reservoir is owned by the State of New York, presently under the jurisdiction of the New York State Canal Corporation. Since 2003, the Hinckley Reservoir also serves as the sole source of drinking water for about 130,000 people in the greater Utica area. 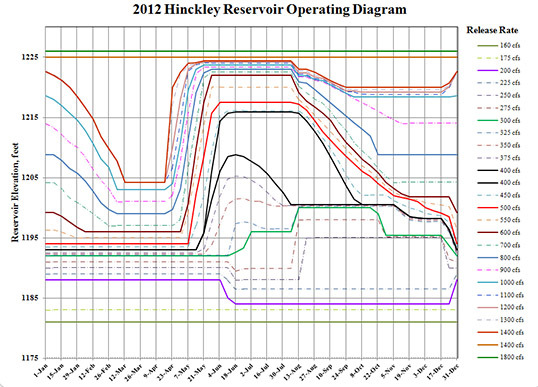 As of April 1, 2013, the 2012 Operating Diagram will be used to regulate the downstream release of Hinckley Reservoir waters. 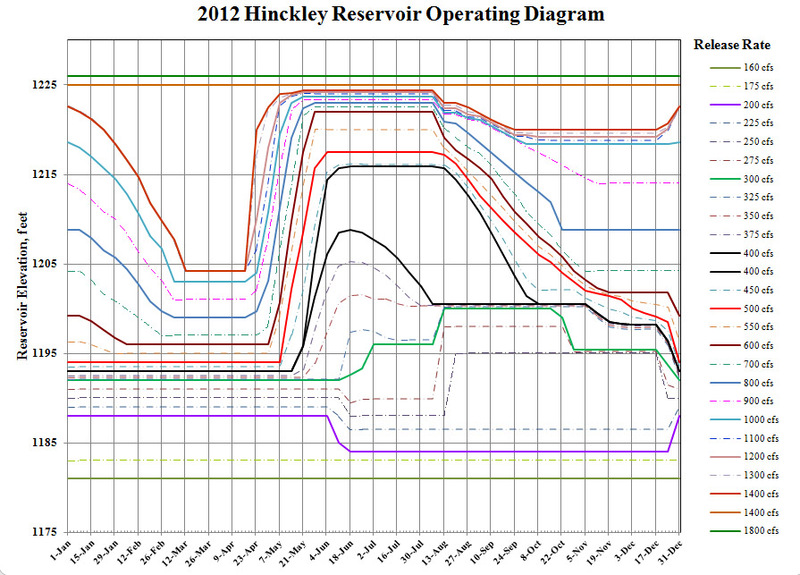 The 2012 Operating Diagram establishes the rates (in cubic feet per second) at which water is to be discharged from Hinckley Reservoir on a semiweekly basis. The downstream discharge established by the 2012 Operating Diagram reduces as the reservoir level recedes in order to maintain sufficient water in Hinckley Reservoir to maintain canal navigation and other uses. The Operating Diagram also provides for increased reservoir releases as the reservoir level increases to help mitigate downstream flood concerns.